Replaces Travel Lanterns with models that look like bright lights. Does not change the light's illumination. Permission given to use this mod in anyway you like. 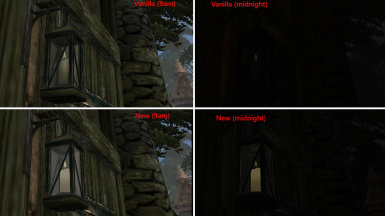 The new candle model is from "Stuporstar's Mesh Improvements Optimized"
Travel Lanterns give strong illumination but the models appear as very weak lights. The inside parts of the lantern now appear illuminated by the candle flame making it appear a much stronger light. The glass panes make the flame appear brighter, but at the same time appear dirtier than the original. I used slash and hack of the vanilla meshes with NifSkope, then added a better quality candle taken from "Stuporstar's Mesh Improvements Optimized". Permission is given to do anything you like with this mod. After all, its only three files!